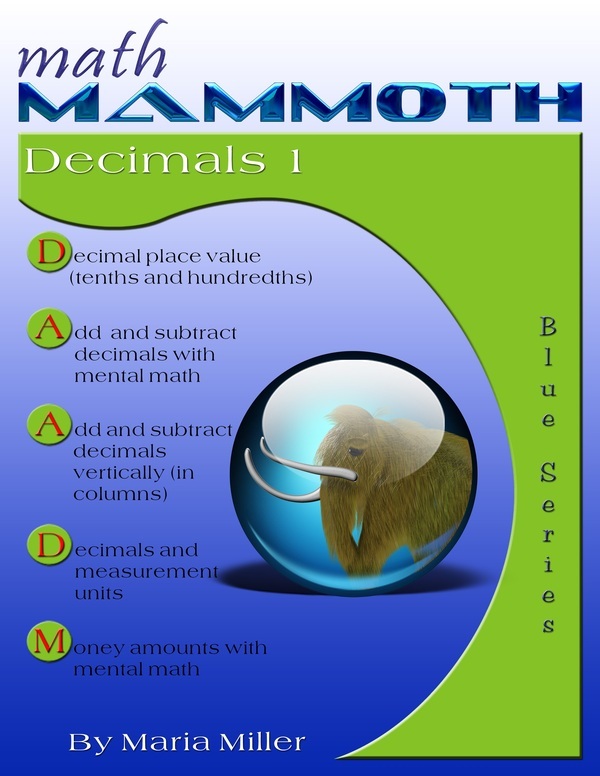 Math Mammoth Decimals 1 downloadable workbook for 4th or 5th grade - a solid introduction to decimal numbers. 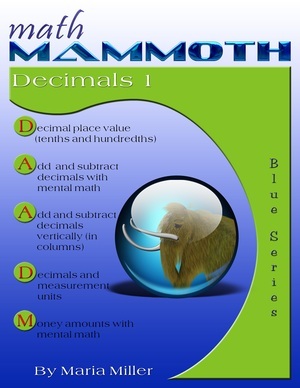 Math Mammoth Decimals 1 is an introduction to decimal numbers, and is best suited for 4th to 5th grade math. This book deals with decimal numbers that have tenths and hundredths - numbers with a maximum of two decimal digits. We only deal with some of the basic operations: addition, subtraction, and multiplication by a whole number, with a strong emphasis on mental calculations. The idea is to lay a solid conceptual foundation so that the student does not succumb to rote memorization of rules and procedures without understanding. The two operations not studied in this book are multiplying a decimal by a decimal and decimal division. Those can be found in Math Mammoth Decimals 2. We use number lines, fraction models, and place value charts to teach the concepts of tenths and hundredths. In studying addition and subtraction, we compare decimal operations with corresponding fraction operations in order to show why they work. A common student error is to add 0.4 + 0.8 = 0.12. Here, the student may be considering the decimal part of a number as a 'separate whole number', and try to apply whole number arithmetic within the decimal part. To help such a student, read the decimals as fractions and emphasize how fractions are added. Think: four tenths plus eight tenths equals twelve tenths, which is 1.2. When we add decimals of different "length" (numbers with different amounts of decimal digits), such as 0.4 + 0.08, you can "tag" a zero onto the end of 0.4 to make adding easier. The problem becomes 0.40 + 0.08. Now, both addends have hundredths, so the answer is simply 48 hundredths or 0.48. This is the same thing as converting the corresponding fractions (four tenths and eight hundredths) to have the same denominator (forty hundredths and eight hundredths). Other topics covered are comparing decimals, multiplying a decimal by a whole number, rounding, estimating, and money problems. Several videos from my Decimal arithmetic playlist can be used in conjunction with this book. My 5th grader and I worked through the decimals book. It actually helped me to understand decimals a lot better also. We were both amazed at how easy they are to work with once you understand the concepts behind them. I love the books. They include a lot of thinking and reasoning skills that our other math program did not include. They also present things in a simple clear manner. No more tears when it comes to decimals!! !